The Teethin’ Pals™ teethers by Nûby™ provide textured surfaces for baby to bite and teethe on during teething periods. Their colorful shape and size are easy for baby to hold, and the vibrant plush characters encourage visual perception. Multiple textures encourage baby's tactile development while giving them options to find the most soothing texture for them. 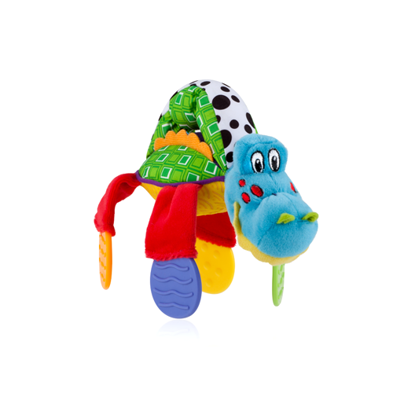 With this teether toy, your little one will have a new favorite soother and a new best pal. My son loves this toy! We have the monkey and he loves holding onto the ears and playing with the ribbons. It’s the perfect size for his little hands with plenty of area to chew on too. I like the mix of teething plastic with the plush on top.. makes it good for snuggling and teething :). Perfect for little ones starting to teeth and interact with toys, definitely recommend! My son loves this teether! He's 5 1/2 month's old and really getting into reaching/holding onto things. This teether is just the right size for his hands to grasp. I like the multiple textures so it keeps his interest and isn't too hard in case he shakes it around. It makes him smile every time he sees it! Definitely recommend for early teethers!